Are your carpets looking a little embarrassing and grubby? Hello my names Jared. We bring your carpets back to life at a fraction of the cost of replacing them. Our latest equipment, training and service will leave you proud of your home again. Leaving your carpets cleaner, brighter and healthier. Our sole aim is to provide each and every customer with the highest level of customer satisfaction possible. 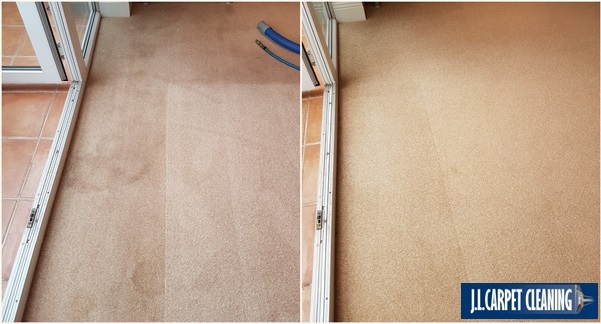 Over the years JL carpet cleaning has built up a reputation unrivalled in Shropshire, and this is backed up with more independent 5 star reviews left by our customers over the years. JL carpet cleaning offer professional carpet cleaning services to domestic, commercial & end of tenancy customers alike. We use some of the most powerful and state of the art cleaning equipment available today. Surpassing hire and DIY equipment available, producing guaranteed results. We will deep clean your carpets removing the build-up of dirt, grit and grime and leave your carpets clean, fresh and healthy again. We are fully insured and carry treatment risk insurance for peace of mind. Furthermore we also off low moisture/dry compound cleaning for delicate floor coverings such as sisal and sea grass. Finally Don’t forget we also offer a specialist rug cleaning service as well. FREE bottle of spot & stain remover when spending £100 or more for FREE FOR LIFE. We offer an experienced spot and stain removal service. We have treated endless accidents and stains with tried and tested professional techniques. Call us to discuss a issue. excellent service, quick efficient and amazing results thank you. Very happy with the service offered. Went out of their way to help. Did very good job. Definitely recommend. Happy to use in the future. Thank you so much to Jared and Jenny for cleaning our lounge carpet. You were very friendly and efficient and did a great job. We will certainly recommend you to friends and family. We are absolutely thrilled with how our carpet looks. Horrid marks that we thought could not be removed , have gone, it looks like new. Fabulous. Also we were treated with such politeness and sensitivity being old age pensioners. I just want thank J.L Carpet cleaning for their professional approach to everything they have done. Highly recommended!!! I had a rug cleaned which was a mixture of fibres, cotton, wool etc, and had coffee, red wine and other stains on it and looked really awful, Jared and Jenny took the rug away for a few days and when it came back it was just like a new one, I couldn't be more pleased and Jared and Jenny are lovely people to deal with, I would definitely recommend their service. Exceptional service, if I could, I would rate them 10, house smells amazing, and carpets look brand new, I will have this service done every year now. An excellent, first class carpet service carried out by a knowledgeable, friendly and professional young man, I wouldn't hesitate to recommend him to anyone who needs their carpets cleaning to a very high standard. Jared and Jenny provided a prompt, efficient, professional and friendly service. A lovely young couple who did a great job of doing a thorough clean of all carpets throughout the house. I would have no hesitation whatsoever in recommending their services. Thanks for an excellent job done on our lounge, stairs & landing carpets. Your company give a prompt and reliable service and we have no hesitation in recommending to everyone. Thank you Jared and Jenny for your friendly and professional carpet cleaning services. We would have no hesitation in recommending you to our friends and family. Thank you for a very prompt and professional service. Carpets now look so much better and thank you for your very friendly service and carpet advice. Would certainly recommend you to others. Excellent throughout, very professional but pleasant. Would and have recommended to several people , would definitely use this couple again. Jared and Jenny sent me a text and hour before their estimated arrival and came promptly. They were friendly, efficient and got on with the job of cleaning my carpets in an efficient manner. A full and open discussion took place before they hoovered the carpets before starting the process of cleaning them. I was very pleased with the result and the reasonable price that was quoted. After making sure that I was satisfied with the completed work they left leaving my house spick and span! Thank you, I will definitely be using your services again. JL carpets were excellent friendly professional team amazing job would highly recommend . Jared and Jenny arrived promptly, completed within the time they specified. Very pleased with the job they did. Carpets look as new and would have no hesitation in recommending them to anyone. Will definitely use them again. Prompt service. Very friendly and efficient. They did a fabulous job of our hall, stairs and landing carpet after a flood. Would highly recommend them. Thank you. Jared and Jenny arrived on time and were very friendly and very professional. They were good enough to send me a text 30 mins before arriving so that I wouldn't have to book a whole day off work and could just set off when they texted me. We had our living room, stairs and bedroom carpets cleaned and the results are fantastic. It took them a lot less time than I thought it would. They are very competitively priced and, even if you do manage to find someone cheaper, I would advise that you still call them for a quote simply on the basis of how good they are and what a brilliant job they did. Sometimes cheaper isn't always better. We will definitely be using them again in the future and recommending them to all of our friends!! Thank you so much Jared and Jenny for doing such a top job of cleaning my carpets. The difference is obvious and the house smells so clean now too. I have had tar in my hallway carpet for 4 years and never thought it would come out but it has totally gone, I am over the moon! You were both so friendly and professional, I will be using you next time and recommending to friends. Thank you. Excellent service from start to finish. Jared contacted me back promptly and was able to fit us in within a short time. I needed treatment to a red wine stain on a beige wool carpet. After the work was completed we could see no trace of the stain, fantastic job. We would definitely use J.L.Carpet cleaning again. Excellent service. Well organised, arrived when expected and did a terrific job - carpets look and smell better than they have in years! Very polite and just get on with the job. would definitely use again and recommend. JL provided a prompt, professional service and our carpets now look like new again. A good team to use! JL took my rugs away and cleaned them recently, and I could scarcely believe the difference they made to them. The colours are so much brighter now and the pile is restored. I couldn't be more delighted with the results. Also, as well as cleaning brilliantly, JL were very efficient and professional, and are lovely, friendly people. I'm intending to ask them to restore my rather worn sofa in the new year, and will definitely be using them to clean my rugs regularly in the future. What a great find! 6 months ago I had my carpets cleaned by J.L. Carpet cleaning and was delighted with the efficient, professional service I received. Therefore I had no hesitation in recommending them to my grandson who has just bought a new house and wanted all the carpets cleaned before moving in. They discovered that there were animal urine stains all over the downstairs carpets, which were only visible under ultra violet light, consequently they had to give the carpets special treatment to deal with the stains and did not increase the price quoted. I would highly recommend this company to anyone. My daughter had been poorly and we needed Jared to come and clean the carpet. He came within 24 hours of my initial call and the carpet looks better than it did before. A very professional service and would definitely recommend and use again should the unfortunate need arise! Arrived on time and did a brilliant job on my carpet especially on a bad stain in the lounge. Definately use this Company again. Professional from start to finish. I looked into a few carpet cleaning companies and went by the reviews left from others. Their prices and service was spot on. I recently moved from the area and was renting my house out, but needed the carpets done dor the new tenants. I cannot recommend this company enough. I will definitely be using them in the future. Professional from start to finish with amazing results. We have had cleaning companies previously to clean our carpets but JL are a few notches above the competition. They have all the equipment, eco cleaning products, they're extremely informative and the price reflects the quality of service. All the furniture was moved by Jared so no heavy lifting. I would highly recommend this company, no point going anywhere else. We've even signed up to an eighteen monthly clean with the price remaining the same for the future. Fantastic job. Carpets are like new again. Would highly recommend j l carpet cleaning to anyone. A great professional service and reasonable prices. Very happy with the workmanship. Very friendly, efficient service, did a fabulous job. Would highly recommend. Have already booked again for next year. Prompt efficient service and job well done at a good price. Would use again. Very impressed with the results, customer service and professionalism. Highly educated in his field of work and extremely good value for money. 10/10 would recommend to all. And will be using again most definite. I was very pleased with the results and would definitely recommend this company. Very professional service and brilliant results! A happy customer! Quick response.Great communication and great carpet cleaning. We can only say positive things about JL Carpet & Upholstery Cleaning. From the first telephone enquiry, to the costing visit and through to the completion of the job, they were professional, efficient and friendly. We can't recommend their services highly enough.